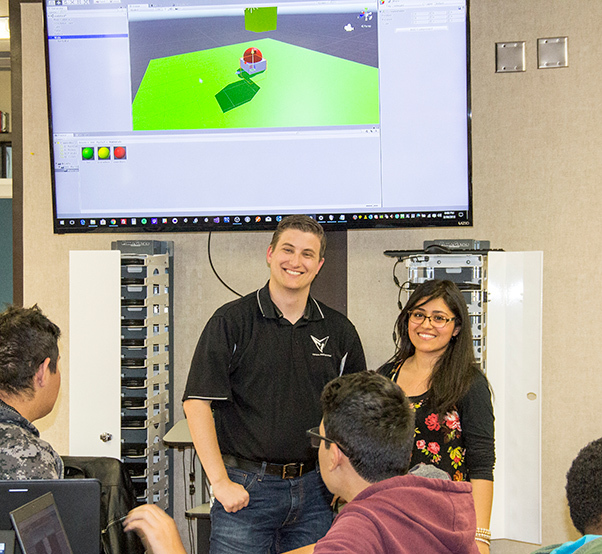 Scott Roberson and Marlene Escobedo hold an Introduction to Unity class at Highland High School in Palmdale, Calif. Escobedo started the program to encourage students to try something new, even if they don’t feel qualified. Additional classes, ranging from beginner to advanced, are in the works and will be free to anyone interested. Contact Scott Robertson at scottrobertson.unityoutreach@gmail.com for more information. Marlene Escobedo, 17, recalls being curious forever. 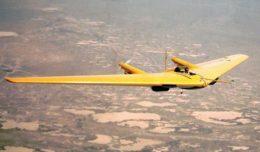 After receiving a Teck Trek Scholarship to attend a girls’ summer science camp in the 5th grade, her dream of becoming an aerospace engineer was born and has been with her ever since. She realized you don’t have to be a whiz at everything — you just have to be willing to try hard, sometimes really hard, to achieve what seems impossible. Scott Robertson, 27, a virtual prototyping engineer for Lockheed Martin, mentored Escobedo during her Lockheed internship. “Scott can really break things down and is a great teacher, so I wanted to show other kids that you can learn computer programing and gaming, or pretty much anything, if you give it a try,” explained Escobedo. She approached her principal, Chris Grado, with the idea to hold a free Introduction to Unity class at Highland High School and, a few weeks later, a classroom was full of eager students. Robertson is teaching students of all levels, including a 4th grader, the basic principles of programming with Unity. Escobedo has interned with Cal Poly, Lockheed Martin and NASA. She started the group to let kids know you don’t have to be a rocket scientist to join STEM activities. “Sometimes you don’t know what you know or how fast you can learn unless you try. Some kids, a lot of kids, lack confidence,” said Escobedo. When Escobedo was 12, she asked her father how the car he was trying to fix worked — and he showed her. From then on she said she was curious about how other things worked, which sparked her passion for engineering. For more information about classes, contact Scott Robertson at scottrobertson.unityoutreach@gmail.com.